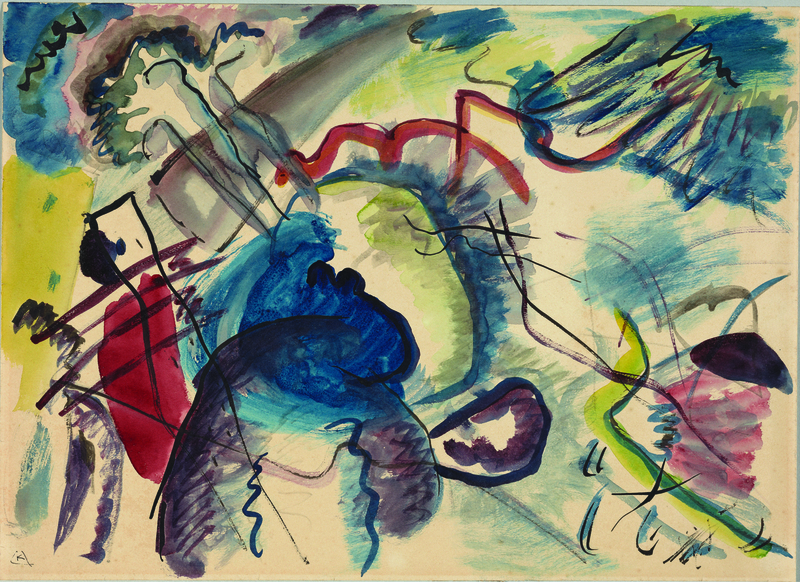 Wassily Kandinsky, Study for Painting with White Border (Moscow), 1913. Watercolor and India ink on paper mounted on gray paper, 10 7/8 x 14 7/8 in. sheet, 13 3/4 x 18 in. mount. Städtische Galerie im Lenbachhaus und Kunstbau, Munich, GMS 131. © 2011 Artists Rights Society (ARS), New York / ADAGP, Paris. This entry was posted in Exhibitions and tagged Wassily Kandinsky. Bookmark the permalink. There’s no media-type mentioned in the citation! Say wha??? I’m guessing watercolor and/or gouache and ink! Thanks for that catch, Roy! We’ve updated to include media. You’re right on point: watercolor and India ink on paper mounted on gray paper.